Regarded as one of the world’s finest festive attractions, Hyde Park Winter Wonderland is the ultimate seasonal destination for friends and family alike. Situated in London’s Hyde Park, which spreads over 630 acres in the centre of the capital, the yuletide spectacular runs from 22nd November 2018 – 6th January 2019. Whether it’s skating on the UK’s largest outdoor ice rink, singing away to festive favourites at Bar Hütte in the alpine themed karaoke booths or witnessing a world exclusive of Backyard Cinema Presents: The Snowman TM, there really is something for the whole family at Hyde Park Winter Wonderland. Entry onsite is free, although some individual attractions are ticketed. Attraction tickets sell out, especially at weekends, so advance booking is strongly recommended. Festive fun for the whole family! With a huge selection of food and drink eateries, this year’s attractions include: The Magical Ice Kingdom, Peter Pan On Ice, Teletubbies Christmas Show, Winter Wonderland Comedy Club, Ice Sculpting Workshops, UK’s largest outdoor ice rink, Zippos Christmas Circus, Backyard Cinema Presents: The Snowman TM Experience, Cirque Berserk, The Ice Slide, Santa Land, the Giant Observation Wheel and so much more. 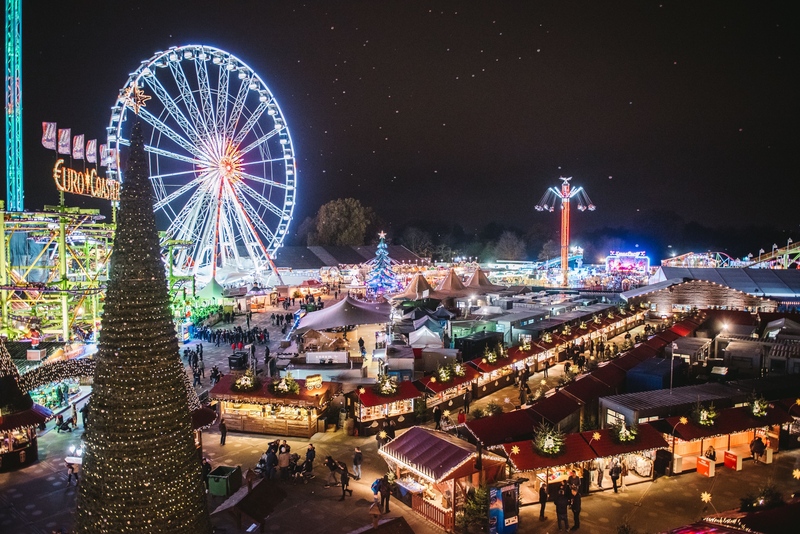 Hyde Park Winter Wonderland brings to life a glittering array of enchanting festive events, guaranteed to get everybody in the festive spirit! Trains from Colchester to London Liverpool Street take approximately one hour and run a regular service every 10 – 15 minutes. Hyde Park Winter Wonderland is situated in close proximity to London underground tube stations including Hyde Park Corner, Marble Arch and Green Park. Alternatively, motorists travelling from Colchester can take the A12, M25 and the A13 which takes just under two hours. Please note that congestion charges are in place, so check the TFL website for full details. Hyde Park is regarded as one of the finest city centre parks in the world, located in the heart of London. For those planning a few days in the capital, there are a whole host of hotels and accommodation dotted around the area. Choose from the plush Kensington on Hyde Park’s South-Western tip to the iconic end of Oxford Street in the North-Eastern corner. Hotels start from £170 (based on two adults and two children) with many hotels within a 20-minute walking distance to Hyde Park Winter Wonderland. For an extensive list of hotels in the area, visit www.booking.com.